Son of Bahrain’s top opposition figure, who has been in jail in since 2011, has called on authorities to provide medical care to his sick and frail 70-year old father. Ali Mushaima, also an activist is staging protest outside the Bahraini embassy in London as he seeks international pressure on his country authorities to provide medical attention to his father Hassan Mushaima who is jailed in prison following his condemnation to life imprisonment in 2012 after he was arrested for fueling anti-government protest at the heart of the 2011 regional uprising known as Arab Spring. 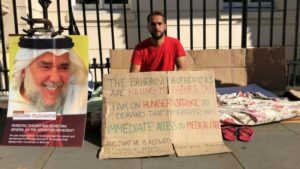 Ali has been on hunger strike and has been camping since August 1 outside the Bahraini diplomatic mission in London. The activist who has been in the UK since 2006 after fleeing his country where has been sentenced to 45 years in prison, said the protest was his “last resort” following failed several attempts to attract national and international attention on the situation of his dying father, The New Arab reports. “I wrote to MPs and I contacted different human rights organizations but nothing has changed,” he said. He told Reuters that his father is being denied medical care. Ali told the news agency that his father had been treated for cancer several years ago, and needed regular check-ups to ensure the disease had not returned. The jailed opposition figure also suffered from high blood pressure, diabetes and a urinary tract infection. Ali also accused prison authorities of refusing to replenish medicine supply to his father. They also denied health checkups to his father. The 70-year old sick man needs a scan every six months because of his diagnosed called lymphoma, his son pointed out. 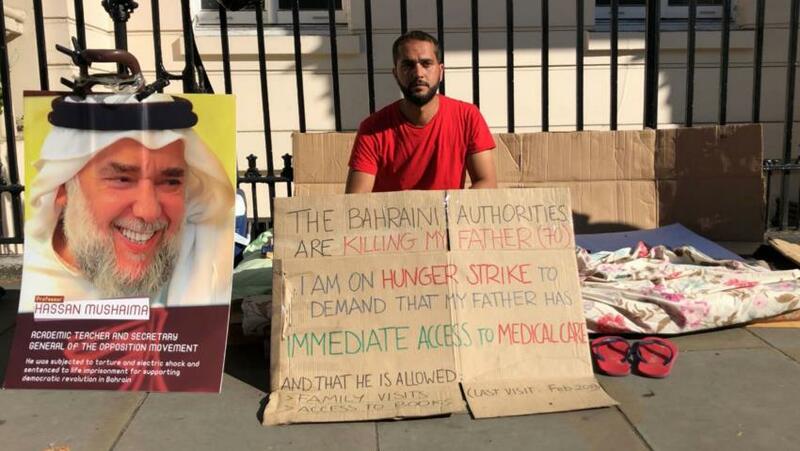 The Bahraini embassy in London last week told Reuters that arrangement have been made so that Hassan attend the medical scans but refused last year to show up in front doctors . Ali rejected the embassy’s claims, saying that is father has refused to see doctors or meet family and relatives with handcuffs around his hands shackles on his feet. Several other political activists are being held in “inhuman” condition along Ali’s father. Human rights groups including Amnesty International condemned the imprisonment of opposition figures whom they refer to as peaceful activists and prisoners of conscience. Written by: KanelkaTagba on August 7, 2018. Posted by KanelkaTagba on Aug 7 2018. Filed under Gulf News, Headlines. You can follow any responses to this entry through the RSS 2.0. Both comments and pings are currently closed.